Sarah Tolley lives in Edinburgh, where she spends far too much time at the computer – it’s the translator’s malaise. Her first published poetry translations were in a book called History of Old Age, by Georges Minois, and since then she has always enjoyed translating poetry. 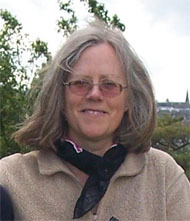 Her job as online tutor for the Open University, teaching a course on the European Union, has been rather short of poetry, and she is grateful to No Man’s Land for inviting her to mediate between two poets, one from Shetland, and the other from Swabia, as part of the St Andrews poetry festival.